The PowerShot G7 X Mark II camera features alarge 1.0-inch, 20.1 Megapixel CMOS sensor that helps capturehigh-quality images and videos. Its wide dynamic range helps ensure both brightand dark parts of an image are fully captured, like the shadowy side of abuilding on a bright sunny day, or streetlights on a dark night. 20.1Megapixels means photos with enough detail to print, or enjoy onhigh-resolution monitors and mobile devices. It also gives additionalflexibility during editing, giving you the option of cropping in on yoursubject for improved composition while still having a detailed, high-resolutionimage. Smooth gradations from light to dark keeps unrealistic banding in solidcolors to a minimum. Thanks to an available ISO of up to 12800 (expandable to25600) and the power of the new DIGIC 7 Image Processor, extremely low-lightphotos and videos are possible, with minimal image noise. Using a high ISO alsoallows for a faster shutter speed, which lowers the possibility of blur causedby excessive hand-held camera shake. For added flexibility, both JPEG and RAWimages can be captured and saved. The new DIGIC 7 Image Processor’s enhancedtracking and detection capabilities help keep subjects in focus, while ensuringeach image has a high level of sharpness and minimum picture noise. Whetheryou’re capturing a fast-moving athlete or a feisty puppy, the DIGIC 7 ImageProcessor in the PowerShot G7 X Mark II camera can stay locked on throughoutthe action. Improved face tracking helps keep your friend or family member thesubject of the photo. Even in extreme cases, like in low saturation orlow-light dusk, dawn or darkened interior moments, the DIGIC 7 Image Processorhelps keep what you’re photographing in focus. It also features the new DualSensing IS, which uses data from the image itself to help minimize the blurcaused by camera shake and body movement. This results in clear, precisepictures even at slow shutter speeds. All this is in addition to upgradeddetail and noise reduction abilities, especially in low light with high ISOsettings. Powerful all around, the DIGIC 7 Image Processor helps ensure yourphotos and videos look sharp and lifelike with minimal unwanted noise or grain. The Canon HS SYSTEM lets you take bright, clear photos asthey happen. Beautiful low-light shots are possible with minimal noise andtruly impressive detail in both highlight and shadow areas. 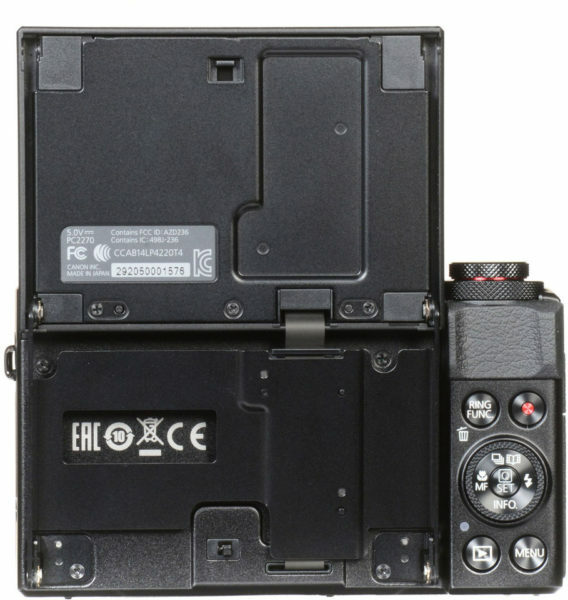 The system is theresult of two technologies in the PowerShot G7 X Mark II camera: thelarge format 1.0-inch High-Sensitivity CMOS sensor, which captures more light;and the DIGIC 7 Image Processor, which actively reduces noise at high ISOspeeds up to 12800 and processes images at high speed, even at full resolution.Experience the freedom of using higher shutter speeds in far more situations,allowing you to capture images with outstanding clarity and detail. *Imageprocessing may cause a decrease in the number of pixels. 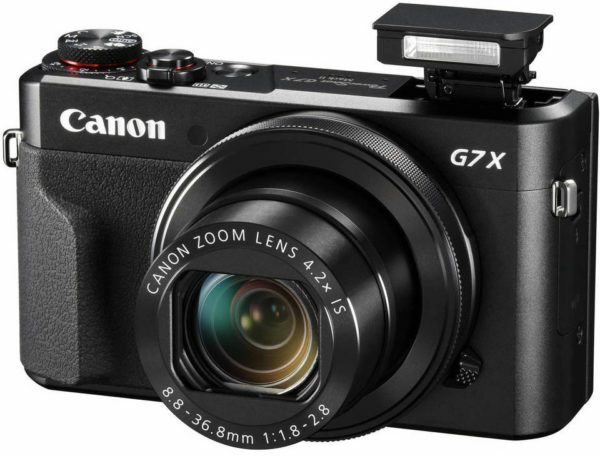 The remarkable lens on the PowerShot G7 X Mark II cameratakes full advantage of the camera’s large sensor, giving your photography awide range of expression. With a bright aperture value of f/1.8 at the wideangle and f/2.8 when fully zoomed to a factor of 4.2x (24–100mm), this lens notonly puts more in your frame, but is equipped to capture an incredible varietyof situations with artistry and precision. Equipped with a 9-blade irisdiaphragm, the lens lets you achieve a beautiful background defocus with shapesthat are nearly round. Capture macro shots from as close as 2.0 in. (telephotoat 1.3 ft.). 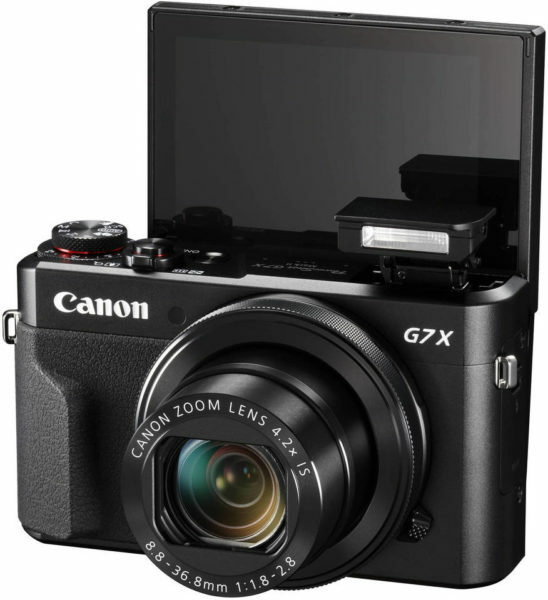 From a design perspective, each of the 11 glass lenses on the PowerShotG7 X Mark II has a multi-layer coating on it, which is similar to theSuper Spectra Coating technology developed by Canon for EF lenses. These coatingshave features like a high transmission factor, ultraviolet protection,resistant surface hardness, and stable characteristics. The coating alsomaximizes suppression of unwanted reflected light from ghosting or flaring todeliver clear images with high image quality. Equipped with Canon’s innovative Intelligent IS, the PowerShotG7 X Mark II camera helps you capture clear, steady images – even in lowlight without using a tripod. 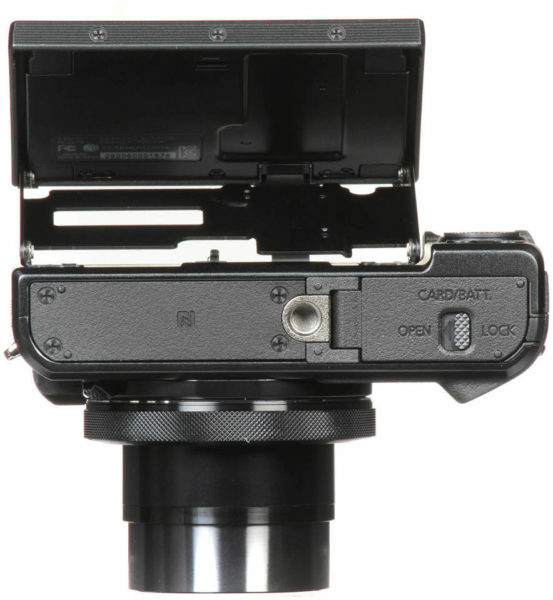 The system automatically analyzes camera movementand applies the best shake correction method for the shooting situation –allowing you to focus on framing and capturing your shot. 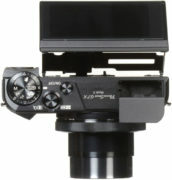 For stills, thesystem selects from Normal IS, Panning IS, Macro (Hybrid) IS and Tripod modes.When shooting video, the system selects from Dynamic IS, Powered IS, Macro(Hybrid) IS and Active Tripod IS modes. Icons clearly mark the imagestabilization mode, whether you’re shooting still images or video. Capturestunning 1080p Full HD video in MP4 format with stereo sound. Whether you’re creating artistic film clips or capturingspecial occasions, the advanced video capabilities of the PowerShot G7 X Mark II camera can catch them in the qualitythey deserve. Incredibly realistic 1080p Full HD video is recorded at 60 fpswith stereo sound in convenient MP4 format. Video is smooth and richly detailedeven when played back on a large-screen HDTV via the camera’s HDMI output. TheMP4 format’s small file size lets you fit more on a single memory card, andmakes downloading and sharing quicker and easier. Manual movie mode is alsoavailable: adjust Av, Tv, and ISO speed and even select focus points by usingthe touch panel LCD screen. You can do this either before or during videocapture to express your vision your way in a wider variety of situations – allfrom a compact camera that is easily portable. Built-in Wi-Fi technology allows for on-the-goconvenience when you want to share your photos and videos with friends andfamily. 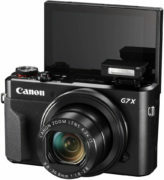 Easily post your images to select social networking and media sites –Facebook, Twitter, YouTube, Flickr, and Google Drive™ – through CANONiMAGE GATEWAY directly from your PowerShot G7 X Mark II camera, orsave them to the online photo album to share anytime, anywhere. 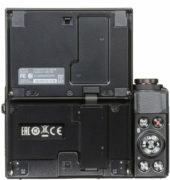 The camera canalso connect directly to both compatible iOS and Android devices, and uploadimages via the free Canon Camera Connect app without a computer. You cancontrol the destination of your uploads to share with everyone or to selectgroups, and even add comments. Sharing video is also easy with Wi-Fi equippedPowerShot cameras, which record video using the easy-to-share MP4 format. Wi-Fi capabilitymakes posting in real time possible, so you can keep everyone up to date withphotos and video even as events unfold. Wi-Fi technology also allows you to transferimages to other Wi-Fi equipped PowerShot cameras or print your photos directlyto a PictBridge (Wireless LAN) certified printer. Thanks to the newly addedWi-Fi Button, you can now connect in both Shooting mode and Playback mode forquick and easy operation. You can even turn on the camera and connect at thesame time with just one press of the button, helping you get right to sharingand managing your files when you like. 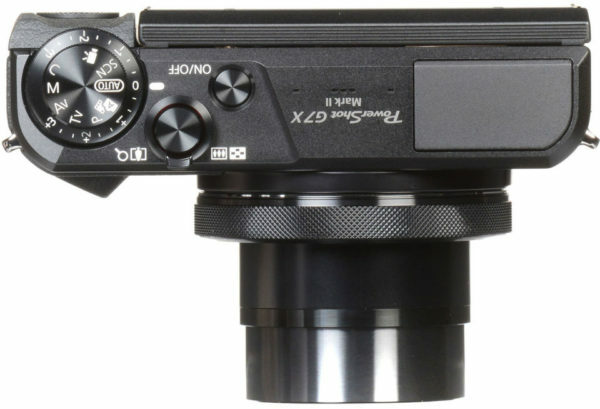 PowerShot digital cameras with built-in NFC (Near FieldCommunication) technology provide fast connectivity with a single tap. Simplytouch the NFC icon on your camera to your compatible Android device, and theCamera Connect app will launch automatically for quick, easy sharing of yourimages. Built-in NFC technology also makes it simpler to install the app. Ifthe app hasn’t been installed yet, once you touch the devices together for thefirst time, the download screen will display automatically. Simply touch thecamera against an NFC-equipped device with the Canon Camera Connect appinstalled, and a Wi-Fi connection is established – no camera operationsrequired. Even if your camera is off, NFC turns the camera on and establishesthe connection (confirming the camera’s nickname and privacy settings beforethe first connection is required). 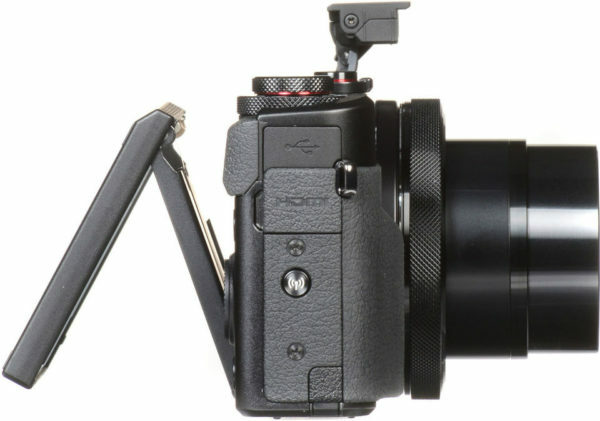 Remote shooting functions of the PowerShot G7 X MarkII camera through your compatible smartphone or tablet have been vastlyimproved with the Canon Camera Connect app. 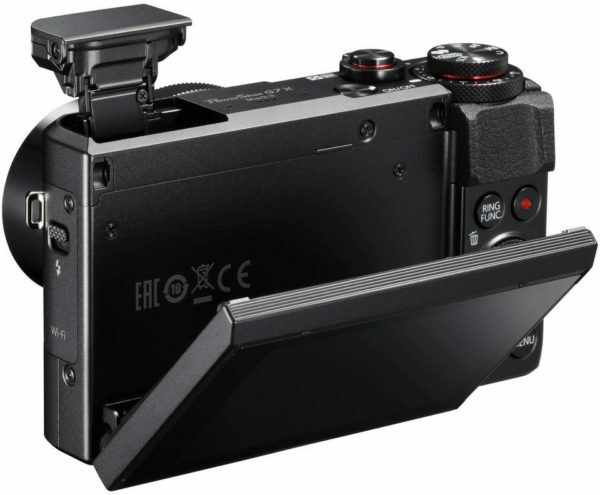 Now a variety of the camera’sexpressive capabilities are available to you: use different shooting modes (P,Av, Tv, M, Custom); enjoy multi-aspect shooting and display; choose AF framemodes (single-point/face detection); shoot in continuous shooting mode; andutilize the AF button. 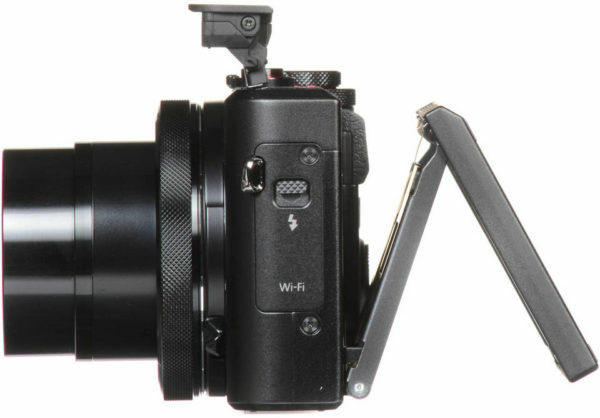 In addition, the Camera Connect app is now universal toPowerShot and EOS cameras with built-in Wi-Fi, so if you switch betweencameras, operation is easy and familiar. In-cameraRAW conversion makes it possible to preview modified conditions of images onthe camera, without the use of a computer. The PowerShotG7 X Mark II camera’s powerfulin-camera RAW conversion lets you adjust multiple aspects of an image after youcapture it, without using a computer. If an image is a little darker than you’dhoped, you can increase the brightness, or let the Auto Light Optimizer analyzethe photo and change the levels accordingly. You can also fine-tune the whitebalance for a cool or warm look, change the Picture Style and more. When you’resatisfied with the results, switch between the original and adjusted image tocheck your work, then save the result as a JPEG for later use. Controlring features a convenient selection lever enabling you to quickly switchbetween step ring and continuous ring movement. Time-LapseMovie helps capture images at set intervals and combines them to create a shortmovie clip of the footage. Panningallows the camera to lock onto the main subject using IS and automaticallyadjust the shutter speed for beautiful background blur. By using a slow shutter speed and Canon’s advanced imagestabilization, the PowerShot G7 XMark II camera’s Panning mode canhelp you capture fast-moving subjects in an artistic and striking fashion.Athletes, cars, trains and more can be kept in focus while the background issmoothly blurred, creating an intense appearance of motion.